Dolphins are some of the most interesting and intelligent creatures that live on this planet. Unfortunately, they are also the victims of some truly horrific human actions. Here are five reasons why dolphins are awesome, as well as reasons why they need our help. Dolphins are highly social animals. They’ve been recorded demonstrating altruistic behavior towards other dolphins as well as members of different species. In a similar story from 2011, whale watchers in Scotland discovered a dolphin who’d recently lost its dorsal fin. They determined that this would have been a new wound for the dolphin (nicknamed “Fin”), which can be a severe injury. Three years later, Fin was discovered alive and well. He was always closely accompanied by several adult members of his pod. Researchers believe the adults were nearby to help support their injured community member. This helped Fin to survive for years despite his injury. Many animal communities will simply leave a sick or injured member to die if they are holding back the group. 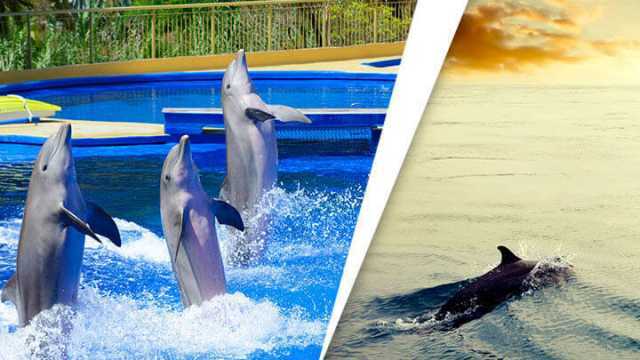 But not dolphins — they take care of their sick and injured. The closest inter-species communication we are able to have comes from our interaction with dolphins. With brains that work very similar to ours, dolphins have become more adept at human sign language than any other animal, including the great apes. Dolphins have been able to learn up to 90 different words in sign language. Unlike the great apes, they are able to understand human syntax. As in, they understand the meaning behind the order of words in a sentence. This unique ability may bring with it the potential to one day lead to advanced interspecies communication. We just need to find a common medium we both speak. Dolphins lack the hands required to use sign language. They also aren’t able to vocalize words in the same way we do. We, on the other hand, are unable to make many of the sounds that dolphins do. But don’t worry, scientists are working on that! Dr. Denise Herzog has developed a synthesizer which mimics the sounds dolphins make. She is hopeful that one day true meaningful conversations can take place between our two species. Whether this has to do with them loving humans or just really disliking sharks is up for some debate. But regardless of their motives, there are plenty of examples of dolphins saving humans from shark attacks. One such case involved British long-distance swimmer Adam Walker. He was attempting a near eight-hour trek across the Cook Strait in New Zealand. He noticed a two-meter shark swimming underneath. But luckily for him, a pod of dolphins almost immediately circled him and swam with him for over an hour. Of course, it is possible the pod decided to swim with Walker regardless of the shark, but this is far from the only example of protection. In 2007, Todd Endris, a surfer from California, was bitten twice by a great white shark. Things weren’t looking too good for him. That’s when a pod of dolphins came to his rescue. They formed a wall between the shark and him. Their help allowed him to get back on his board and paddle to safety. Another example involved a group of five divers who were lost for over 13 hours in the shark-infested Red Sea. They reported that a pod of dolphins surrounded them the whole time. They even jumped out of the water when rescue boats were nearby. The divers believe the dolphins were trying to notify the boat of where they were. Dolphins are one of the only animals ever recorded to give each other names. A certain type of whistle is used for a dolphin’s name and they will respond when called. Parrots will give names to their young and apes can learn sign language for names. However, dolphins seem to have the most advanced naming system of any non-human animal. There are dolphins serving in the U.S. Navy. Granted, they are possibly not doing so willingly, but one might think that if it was explained to them the importance of this work (and that they would still be given food in return) that they would still choose to take part. Because of their unique ability to use sonar to obtain a visual map of underwater areas with low visibility, the Navy will often use trained dolphins to find things. This work has generally been used to find sea-mines and lost swimmers. Currently, a team of dolphins is being trained to find the critically endangered vaquita, a small marine mammal down to only 60 individuals. The dolphin team is being trained to accompany boats to vaquita territory and jump out of the water when they find them, thus letting the boat know where to look. The vaquitas will be brought to a protected area of the ocean where they will be safe from illegal fishing vessels. Admittedly, I have a slightly ulterior motive for presenting all of these awesome facts about dolphins to you. From September to March every year, the Taiji dolphin hunt takes place. In this event, thousands of dolphins are either killed for their meat or sold to aquariums to be put on display. Despite the large influx of activists who come to protest the event every year, the hunt is currently going on at this very moment. The Dolphin Project is hoping you will sign this petition to the prime minister of Japan and share it with everyone in your social networks. They also hope you will take the pledge not to visit dolphin shows. The controversial Sea Shepherd Conservation Society is also looking for volunteers. Please share this article as widely as you can, because dolphins are awesome and they deserve your help. Next articleIs Giraffe Milk Really The Next Superfood? Hey Buddy!, I found this information for you: "5 Awesome Reasons We Should Help Save Dolphins". Here is the website link: https://www.thealternativedaily.com/reasons-to-help-save-dolphins/. Thank you.